In this age of social media, no matter what the industry, it is in the business’ interest to have digital presence. Just maintaining presence for the sake of it is one thing, but doing a great job of it is another. 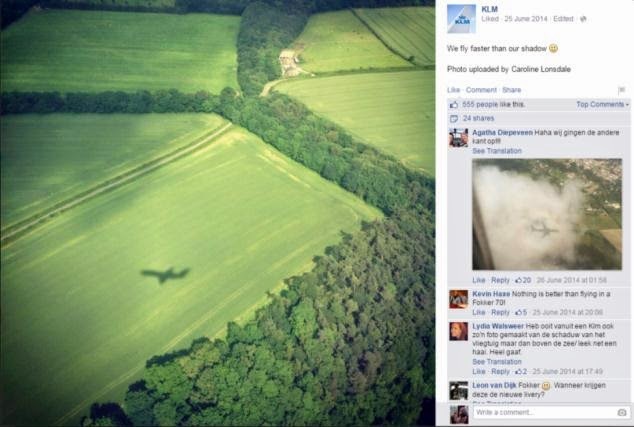 Few other aviation brands are doing as good a job on social media as KLM is. Just browse through the airline’s global Facebook page. You don’t need to be a frequent flyer with the airline or a travel enthusiast or a plane spotter to enjoy their page. You simply and inevitably will enjoy it. And what is remarkable is that the brand’s social content has such a universal reach and appeal. Let us see what they are doing well and more importantly, differently. 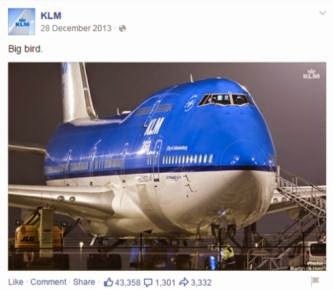 You would think seeing images of the blue KLM plane daily on Facebook would be boring. After all, the aircrafts look alike and the colours are the same. So what’s new? Well, they share some really magnificent pictures of their fleet from really interesting angles – right from the nose to tail! The images are sharp, professional and well-edited. Most images are given a black and white colour tone with that hint of familiar blue. 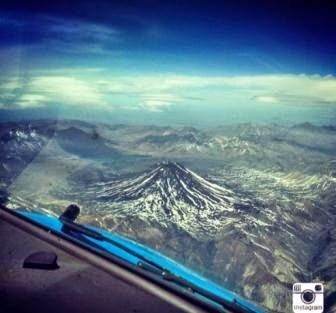 And not just the aircraft on ground or in flight are shared, but beautiful scenic views from the plane are also showcased. Now who wouldn't like a glimpse of a sunset from 30,000 ft above! Images alone may not always be able to do the talking. You need to support them with a great caption. KLM’s social media team has a genius copywriter who comes up with some really catchy phrases that say it all without beating around the bush. By that we mean, their updates are not five long lines of boring jargon; they are crisp, precise and fun phrases. There is no better form of flattery for a brand than user-generated content. 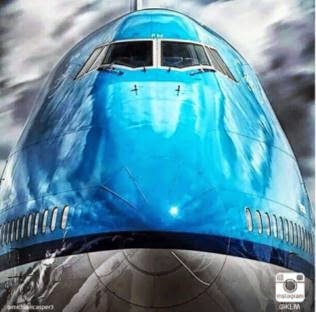 KLM’s image bank goes ka-ching way too often owing to the sheer volume of images that the airline’s fans click. Most of the images are shot using professional cameras; some of them are even taken by aviation photographers. 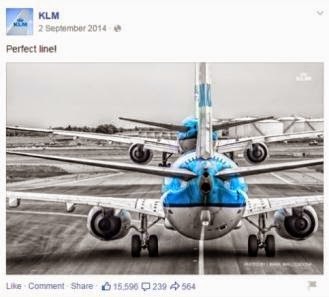 KLM also smartly has a dedicated photo album onFacebook named ‘Fan’tastic Photos where fan-generated images are uploaded on a monthly basis. Every brand wishes their enthusiasts on festive occasions. But how do they do it? Usually with a dull stock image. 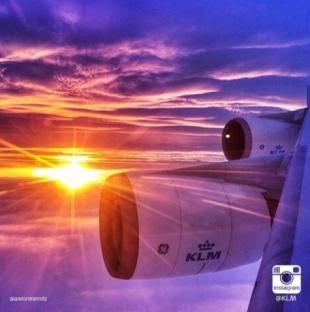 KLM does it with a touch of brilliance and a dash of its signature blue! The brand is seamlessly incorporated into the messaging in a way that it fits like a glove! 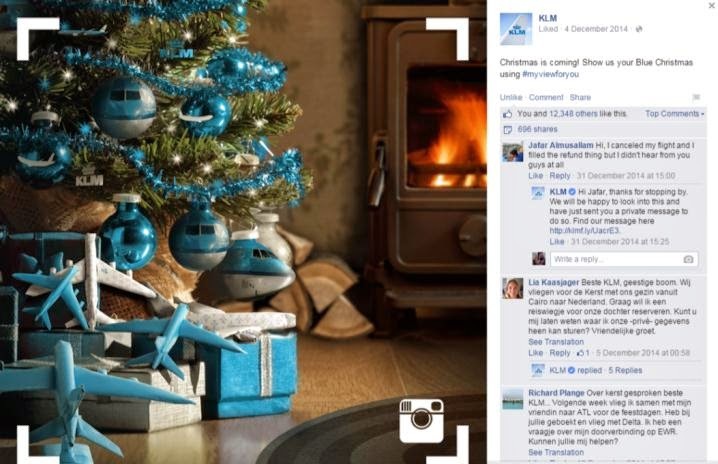 For Christmas, KLM was not afraid to turn its planes into decorative ornamental balls adorning a Christmas tree. The brand went tongue-in-cheek when they showed Santa relaxing in KLM’s business class along with his antlered crew, Dasher, Dancer, Prancer and the lot. In one picture, the plane had sledge runners instead of wheels, and it was given the ingenious caption of ‘Sledging home for Christmas’. It is always intriguing for people to know what goes on behind the scenes, in KLM’s case behind the gates of the hangar! For instance, how is the plane painted? What evolutionary processes did the brand logo go through? How can aviation photographers take better clicks? Who are the Master Chefs behind the food served? 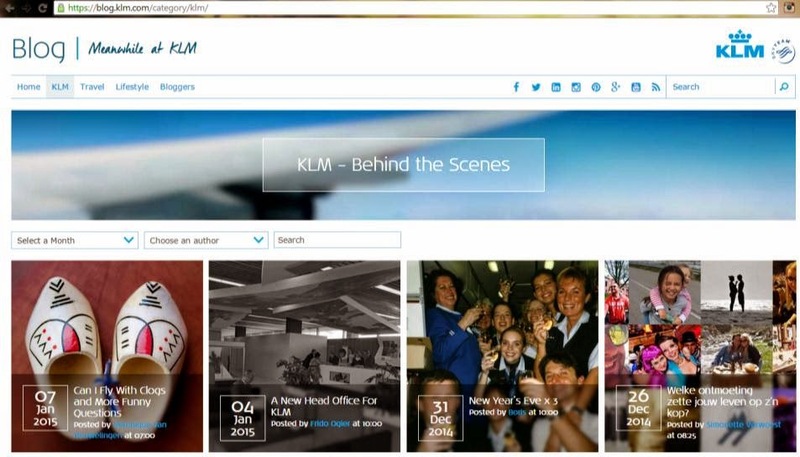 KLM reveals all this and more on their blog aptly named ‘Meanwhile at KLM’. One of KLM’s content tangents is ‘What if KLM was…’ Under this theme, the brand bravely explores what it would be if it were not an airline service. 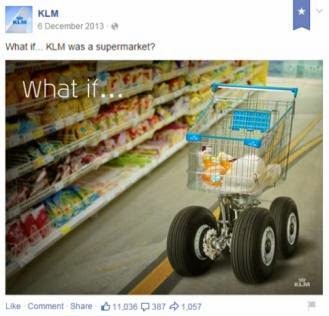 From F1 cars and Nike shoes to Oreo cookies and even a supermarket and a real estate company, KLM ponders it all! Whether it’s the wings or wheels of the plane or the blue and white brand colors, elements of the flight are used to morph the brand into a parallel product or service. Marketers have learnt to acknowledge the importance of heritage for the purpose of brand storytelling. The origin and concept birth of the brand plays a significant role in educating people about the brand. It helps to foster a bond between the brand and its customers. But heritage storytelling should be done keeping in mind relevance and appeal to today’s customers (the millennials in particular). 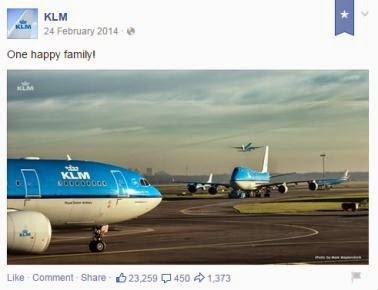 KLM’s Editor in its Corporate Communications wing personally leafs through the brand’s rich history and shares interesting snippets on the official blog. Case in point, they created a compact and vibrant visual to compare today’s check-in counters versus those in the black-and-white era. KLM’s YouTube channel proudly shares an old video clip of actress Audrey Hepburn descending the flight in 1954. If a brand has a rich and glorious past, it needs to be told and shared. 8) It’s a bird, no it’s a plane…no it’s home! AirBnB weds KLM, now this is called a match made in heaven! Who ever thought you could make a home of a plane! With décor elements like KLM’s iconic miniature house souvenirs, little potted plants, a library and other furniture, the MD-11 was transformed into a warm and welcoming home. A night at the airport never looked this inviting. 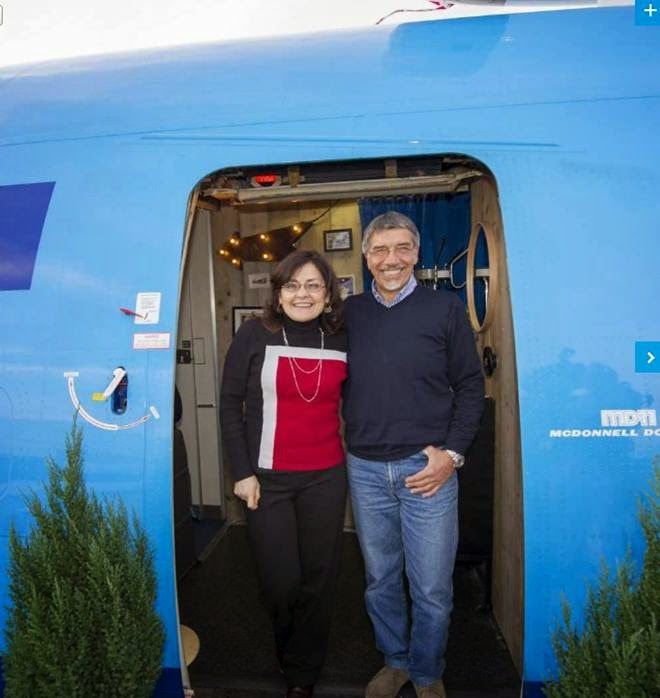 The first guests Cristina en Tommaso who booked a night in the aircraft through Airbnb had their stay documented on KLM’s blog. The documentation captured their first reactions and how they spent their time (including what they ate for dinner!) through candid pictures and videos. Red-eyed and want to catch a wink or dozing off in a cramped up hard seat at the airport – we’ve all been there and done that for whatever the reason - flight delays, layovers or weather issues. Wouldn’t you love it if someone handed you a feathery pillow or a blanket to snuggle in? That’s exactly what KLM’s #HappyToHelp crew did. Don’t believe me? That’s why they captured this gesture on video and shared it on social media! Two lessons can be learnt from a video like this; firstly, nothing looks staged, and secondly, they leave you with that all-is-well-in-the-world feeling. 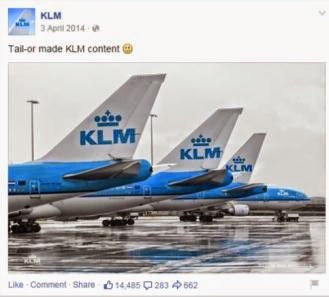 KLM has over 150 social media agents who are constantly monitoring what’s being said about the brand online. One can only imagine the sheer volume of reviews, requests, suggestions and complaints that they have to deal with. They guarantee that they will respond to customers within an hour, day and night, and they can do so in ten languages. Pretty remarkable right? It goes to show they are flying in the right direction, on track with the times, ensuring crucial real time online engagement with customers.